Several purchasing options are available. 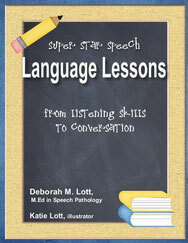 Super Star Speech: Expanded Edition includes the combined content of the the other three Super Star Speech books, plus additional material. Please visit the "Learn More" page to see sample pages and for help on deciding which volume is best for you. Click on any of the options below for more detailed information. Shipping is $2.95 per order. This volume is available in printable e-book form (PDF) at Currclick ($6.95) or for Kindle ($7.95). Language Lessons will not enable you to do actual "language therapy" with your child, as that is something that only a qualified speech language pathologist can provide. However, it includes over 140 pages of ideas and activities to use with your child that will help to improve his or her listening skills, memory, vocabulary, grammatical skills, and conversation. Exercises and activities to stimulate and improve language skills in children with normal or delayed language abilities. Additional practice exercises for children who are already in language therapy.·Activities that are categorized by type, making them easy to use with children who have diagnosed or suspected delays in specific areas, such as auditory memory or vocabulary. Activities that are categorized by type, making them easy to use with children who have diagnosed or suspected delays in specific areas, such as auditory memory or vocabulary. Fun activities to do with your child. These shouldn't be considered "work," but will hopefully provide enjoyable, yet useful, activities for parents and children to do together. This volume is available from Currclick in e-book form. Super Star Ch, J, and Th will aid you in teaching your child to correctly pronounce the Ch, J, and Th sounds. This manual can stand alone for a child with one or two speech sound errors or can be used as a supplement to Super Star Speech: Speech Therapy Made Simple, providing additional pictures and activities. The manual includes specific tips for teaching these sounds at home as well as picture cards, worksheets and games specifically designed for the practice of Ch, J, and Th. All games and activities are unique to this volume. 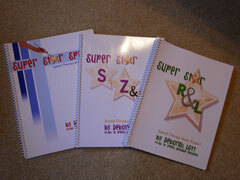 Buy an e-book version of Super Star Ch, J, and Th.